This section is here to explain where the main parts of the story of Patlabor take place, and to show how isolated the Special Vehicles Section 2 is from of Tokyo, and the rest of the Tokyo Metropolitan Police Department. The SV2 Station House is situated on a recently claimed lot of land on Tokyo Bay. Essentially it is a gigantic hanger built to house both Division 1 and 2's Labors, equipment, personnel and the mechanic's personnel and equipment. The quarters are cramped but somehow there seems to be enough space for everyone and everything. Due to necessity, on the side of the Station House is a greenhouse where Hiromi grows tomatoes. There is also a coup for chickens, where Hiromi tends for them and collects their eggs. The rear of Station House backs on to Tokyo Bay. Luckily the SV2 has a speedboat in their possession which unofficial gets used for fishing by the mechanics. With their isolation from Tokyo, food is a major problem, hence their reliance on tomatoes, eggs and fish. A direct highway (which hardly seems to have any traffic on it), passes right past the front of the station house. As you can see from the satellite map above, the station house is just a few kilometres away from Tokyo International Airport (directly south of the station house), which is why planes can be frequently seen flying overhead in the anime. The closest source of food to the SV2 Station. It takes around 10 minutes on a moped to get there though. So unless you've brought you lunch, you're not going to eat. Sandwiched between Kawasaki Artificial Island 1 and Kisarazu Artificial Island 2, is the main Babylon Project Dyke. 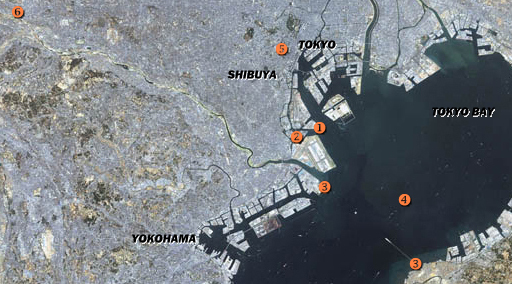 The eventual plan is to drain the area behind to create more space for the ever growing city of Tokyo. Though the Ark is only mentioned in the first movie, I still thought it was important enough to mention here. The Ark sits closely to one of the major construction projects, the main dyke of the Babylon Project. The Ark is a massive set of platforms about 500 metres in length and 150 metres tall. Construction Labors are manufactured, tested and repaired there. You might have noticed that the "beloved" Special Vehicles Unit Section 2 is situated quite a long way from the Tokyo Metropolitan Police Department (TMPD). To a degree the SV2 is not liked within the TMPD and some higher-ups consider it to be a dumping ground for problematic officers. This and possibly space issues within Tokyo is probably why the SV2 have been placed way out on the outskirts of the city. This is the main factory that designs, tests and manufactures Shinohara Labors in Japan. Shinohara is the biggest producer of Labors and supplies the Ingram 98-AV to the TMPD. It is also the place that the SV2 have to travel to repair Patlabors that are damaged beyond the SV2 mechanic's expertise. So you can see that this is something that they don't want to do that often considering the distance.